The HESI A2 test is an essential test for prospective nurses. Institutions use this test to screen applicants to their nursing degree programs. Applicants who do well on the exam improve their chances of winning admission, while those who do poorly will likely be turned down by the school. Technically, the full name of the exam is the Evolve Reach Admission Assessment, but it’s rarely referred to by its full name. It is given on-site at many colleges and nursing schools, and also at any of the hundreds of Prometric testing centers. There is no paper version of the test; it must be taken on a computer. Nearly all questions are multiple-choice. There are four broad categories on the exam – Math, English Language, Science, and Learner Profile. The Learner Profile section contains three sections. Critical Thinking is 30 minutes long and has 30 questions about your abilities and aptitudes in the areas of reasoning, problem solving, understanding data, etc. The other two sections in this category, Learning Style and Personality Profile, each last 15 minutes, and contain around 30 questions between them. These sections are not scored. The math skills section consists of 50 items, and it must be completed within 50 minutes. In the math skills section, you will be asked to solve problems involving basic addition, subtraction, multiplication, fractions, decimals, ratios, proportions, and measurement. Personal calculators are not allowed, though the computer program used for the HESI A2 test does include a basic calculator. You must score at least 75% on this section of the test. There are nine content areas on the HESI entrance exam. These areas cover specific math, science, reading skills. The HESI entrance exam also includes a Personality Profile and a Learning Style section. What subjects are on the HESI test? The HESI Test focuses on nine specific subjects. These are Vocabulary and General Knowledge, Reading Comprehension, Grammar, Basic Math Skills, Biology, Anatomy and Physiology, Chemistry, and Physics. How many questions are on the HESI test? There are a total of 326 questions on the HESI entrance test. Do you get to use a calculator on the HESI? You are allowed to use a calculator on the HESI exam. However, you cannot bring your own. There will be a digital calculator available on-screen. What does the HESI stand for? The HESI stands for Health Education Systems, Inc., with A2 standing for Admission Assessment. How many questions are in each section of the HESI A2? Each section of the HESI A2 contains 25-50 questions. All science sections contain 25 questions, while all math and English sections contain 50 questions. The one exception is Reading Comprehension, which contains 47 questions. How much does it cost to take the HESI? Every school sets their own cost for taking the HESI entrance exam. You can expect to pay anywhere from $35 to $70. Each section on the HESI exam is individually scored. Each school sets their own passing score for the HESI exam. The minimum score for most nursing schools is 75-80% on each section. What is the HESI A2 exam for? The HESI A2 exam is used to test academic readiness of those who are wishing to enter nursing school. How do you sign up for the HESI? To sign up for the HESI entrance exam, you must have an Evolve account with Elsevier, the exam sponsor. You can create an account here. The English Language category is made up of the Reading Comprehension, Vocabulary and General Knowledge, and Grammar sections. You must score at least a combined 75% on the three sections of the English language composite. The reading comprehension section consists of 47 items, which must be completed within one hour. In the reading comprehension section, you must perform tasks like defining words in context, making logical inferences, and finding the main idea of a passage. All of the passages used in the reading comprehension section are related to health. In the vocabulary and general knowledge section, there are 50 multiple-choice items. This section of the HESI A2 focuses on the vocabulary commonly used in health care. You will be given 50 minutes to complete this part of the exam. The grammar section of the exam consists of 50 items, which must be completed within 50 minutes. In the grammar section, you will be asked questions related to parts of speech, important grammatical terms, and common grammatical errors. As in the other sections, the questions are tailored to the tasks common to healthcare. The Science Category breaks down like this: Biology – 25 questions in 25 minutes; Chemistry – 25 questions in 25 minutes; Anatomy and Physiology – 25 questions in 25 minutes; Physics – 25 questions in 25 minutes. As of this writing, Physics is not yet a permanent section; it’s being tested. Also, many schools don’t require applicants to take all of the science sections. Nursing programs decide for themselves which HESI A2 sections their applicants must take. Nearly all schools require Anatomy and Physiology, but for many nursing programs, it’s the only required section in the Science category. As with the other sections, you’ll need to score a 75% or better on whichever Science sections you’re required to take. 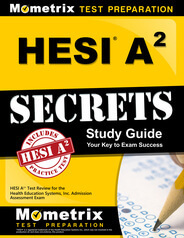 Explore our free HESI review provided by Mometrix. Check out our premium HESI test study guide to take your studying to the next level. If you benefit from these materials, just click the link below! 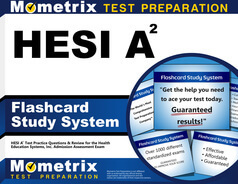 To compliment our HESI book, we also offer extensive flashcards for even more HESI exam prep help. We hope you enjoy our products! Your purchase helps us make more great, free HESI certification content for test-takers just like yourself.